Do you remember the time when it was outrageous to think about touching your computer monitor? Leaving a greasy finger print that would affect the screen quality was feared. However, touching a screen is the new normal, with people now expecting to be able to touch, swipe or pinch any screen placed in front of them. Interactive screens (touchscreens) have become a major part of our lives, and this trend shows no sign of slowing down anytime soon. But why are they so popular? Let’s look at the 5 benefits that these devices bring to our lives. 1. Interactive screens can be compact in size and mobile. One of the main benefits of interactive screens, such as tablets, is the fact that they are an all-in-one solution. There is no need for a keyboard or a mouse, or the accompanying wires and cables, meaning they are easily transportable and don’t require a large desk to use. People are no longer tied to their desk, and can keep on top of their emails from virtually anywhere. From toddlers right through to pensioners, using a touch screen comes naturally. Many people aren’t confident using a computer and are even scared of a mouse. However, the notion of pointing at the thing you want with a finger is instinctive, that is why touchscreens are so accessible. Using touchscreen is as simple as pointing at a location. They are increasingly popping up in doctor’s surgeries, airport check-in desks and cash machines, which are utilised by all people irrespective of their ability to use other, more traditional computer devices. It is a widely commented fact that keyboards contain as many germs as a toilet. The gaps between each key is a harbourer of bacteria. In contrast, interactive screens are usually made of a single hard-coated surface, making them easy to clean and very suitable for use in restaurants and other public environments. Interactive screens are speeding up the completion of tasks. Think about how long it takes for you to get the mouse to appear on the screen, then get the arrow to point to the icon you want to click. With a touchscreen, you can directly touch the exact button you need without navigating across the screen with a mouse to click it. It’s instantaneous. Do you remember the time that computers in the entrance of cinemas had track balls and keyboards, and navigating took forever? Now it’s all completed through touch, like supermarket self-checkouts and its efficiency is increasing customer satisfaction. Touch screens can add value to the lives of those with physical limitations. Using a touchscreen will help them operate the device directly, instead of using trickier mouse and keyboard setups. Midshire has supplied touch screen devices to a national charity supporting children and young adults with complex learning disabilities. With the addition of a 3D printed grid system to create a boarder around apps, the users are able to interact with technology, which they were previously excluded from. 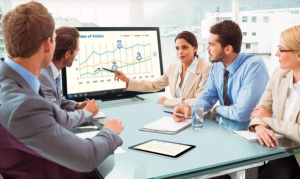 Midshire supplies a wide range of touch screen technology, ranging from small devices such as tablets, designed for individuals to use, up to large screens designed to meet the needs of busy office spaces and classrooms, designed for larger groups to aid collaboration.